LGBT choirs 同志合唱团 pt.4/12 - 音乐与演讲 - 英语交流吧论坛 - Powered by Discuz! 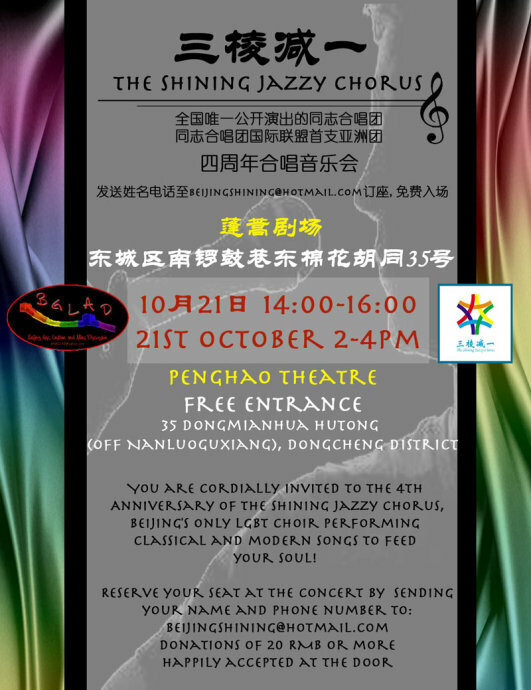 Founded in 2008 at Beijing, the Shining Jazzy Chorus (三棱减一合唱团) is now, with around 20 regular performing members, the largest and the only public performing LGBT chorus in mainland China. SJC is a member of the Gay and Lesbian Association of Choruses (GALA Choruses). The Chorus is also known as Beijing LGBT Chorus. Beijing Video from Eric Lane Barnes on Vimeo. GMT+8, 2019-4-23 06:39 , Processed in 0.204941 second(s), 39 queries .